16/03/2018 - West Midlands Bike Theft: Light at the end of the tunnel? Freedom of Information (FOI) figures that have been received by the Motorcycle Action Group (MAG) in the West Midlands are demonstrating a glimmer of hope for all riders in the region. Figures for the last quarter of 2017 show a 25% reduction in motorcycle theft in the West Midlands when compared with the same period in 2016. Figures for the last quarter of 2016 showed a massive spike that seemed to coincide with the antisocial use of motorcycles around Halloween. West Midlands Police activity on the lead-up to Halloween 2017 appears to have shown dividends. Despite a massive rise in car theft (78% increase in 2017 compared to 2016) West Midlands motorcyclists are still over 8 times more likely to suffer from vehicle theft than car owners. Interestingly cyclists, who have seen significant infrastructure investment in secure parking facilities, can boast that cycle theft has, in the same period, actually reduced by nearly 7%. 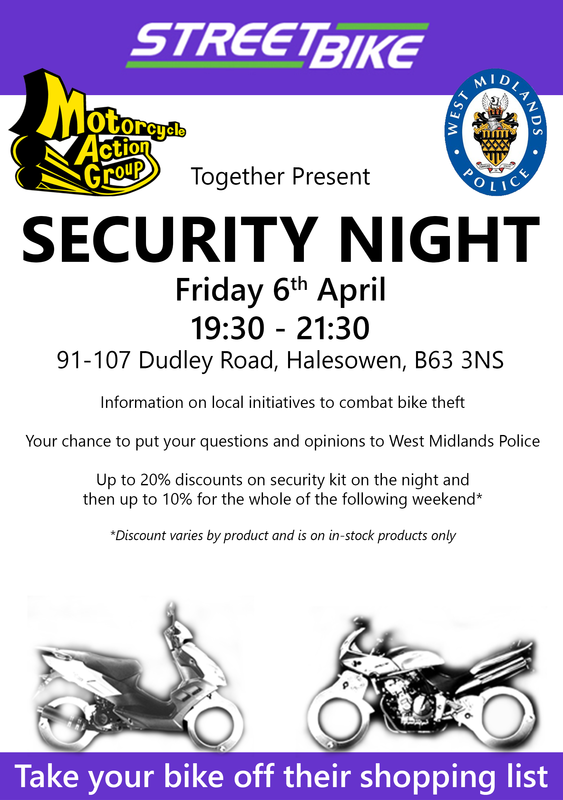 West Midlands MAG has partnered with West Midlands Police and Streetbike to hold a motorcycle security night on 6th April. Attendees will have the chance to hear what West Midlands Police are doing about bike theft, hear how MAG is working on the issue locally and nationally and receive some excellent discounts on security devices for their machines. The event will give bikers the opportunity to ask questions and make points directly to the Police as well as getting help and advice on keeping their machines secure. Find more details on the West Midlands Motorcycle Action Group Facebook Page.